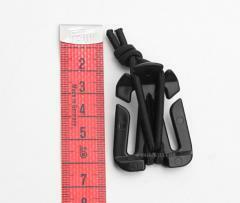 A clever little trinket, the Wed Dominator puts your excess webbing straps in place and can also be used to attach a number of small items onto straps or PALS-webbing. The Wed Dominator is made up of a tri-glide style buckle with slits that allow it to be quickly attached to and removed from any 25 mm (1") webbing straps and a simple shock cord loop. 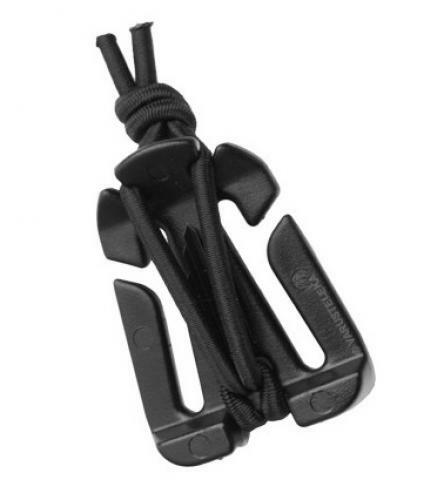 The elastic cord loop is easy to open and secure and completely noiseless. The loop is also easy to shorten by simply making a new knot, if you need to make it longer we offer proper MILSPEC shock cord for DIY use. 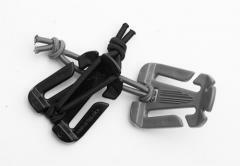 The most common use for the Web Dominator is probably to tidy up excess straps on rucksacks etc. but it can also be used to attach small gear such as hydration bladder tubes, flashlights onto packs and vests. Even large items such as shovels and tools can be secured with the Wed Dominator, but may require you to make a longer shock cord loop. A very versatile little thing! These are high quality MILSPEC stuff, tough enough for military etc. rough use and abuse! Hyvä vekotin, sopii kuin nakutettu tst-partiorepun viilekkeeseen. Pitää juomaletkun sopivasti kiinni. Helppo avata ja sulkea. Hyvinkin hintansa väärti. My camelbak tube used to hit me in the face when I ran across the hills with my bergen. Due to this clip, no more. Useful for countless other trinkets too. Be an operator , and dominate. With clip. Näitä saa 10kpl tähän hintaan kiinasta, samaa laatua. Great to use for lengthy backpack straps. Tighten up the straps and gives you a place to secure a small item, such as a monocular, light, knife, or other item you want handy. Good stuff. These to a American are grey with silver cordage. They do work good and will hold one to several folds of strap. Very good idea and quality. I am very pleased. I would like some in OD or black. Update, ordered black ones and am very pleased! The more you think you the more you can find a use for these. I got extra just to keep around. These are nifty. Mine is helping an old NVA Sturmgepack to accept a modern hydration bladder. Ihan helevetin kätevä! Saa vaikka mihin kiinnitettyä semmoisen minkä saa mahtumaan tuosta kumilenksun välistä. Itse käytän Särmä TST taistelurepun olkaimessa, kantohihnan pehmusteen kohdalla(jotka olen nekin ostanut, myös hyviä!) lampun paikkana, elikkä lamppu menee tohon web dominatoriin hieman voimaa käyttäen joten siihen saa aika hiton hyvän paikan lampulle, ainakin omasta mielestä. Itsellä vielä lamppu on olkapään kohdalla joka tekee sen niin että se osoittaa eteenpäin, eli pystyy laittamaan päälle vaan. Ei edes tarvitse lamppua kädessä pitää! Keeps the extra end of my backpack strap secure. Very well thought-of practicality. Tällä vääntää vielä 35 millinkin nailonhihnan nippuun ja pois roikkumasta.